© 1999, 2011 Dale Furutani Flanagan. All rights reserved. It’s rare that an author has the support of a string of great editors this early in his career. I have. The editor of this series, Zach Schisgal, has been a source of many improvements and much kindness. The editor who acquired this series for William Morrow, Elmer Luke, had faith in a mystery that broke the rules and had a protagonist with a very different perspective and character. At the publisher of my modern Ken Tanaka series, St. Martin’s Press, I had a similar experience with Keith Kahla and Shawn Coyne. I wish to acknowledge the help of all these editors. Editors’ names don’t normally appear in a book, but the result of their hard work always does. Thanks also to Sinya Shaeffer and the people in the map room of the U.S. Library of Congress, Nachiko Lee, Rick Hencken, and Neeti Madan. In this book, names follow the Japanese convention, in which the family name is listed first, then the given name. Therefore, in “Matsuyama Kaze” (Mat-sue-yah-mah Kah-say), Matsuyama is the family name and Kaze the given name. , his long sword, from its scabbard, he held it before him like a necromancer’s divining wand, waving vague circles in the air as he waited for spiritual inspiration. cup in one hand. He looked about him, searching for a target for his friend’s wavering sword blade. With a burst of drunken inspiration, his gaze fixed on the sakè cup. “Cut this,” he said, holding up the cup. It was early afternoon, but the two samurai had apparently been drinking for most of the day. In loud voices, they had challenged each other to a display of swordsmanship. ,” he counted; then he threw the cup up in the air. The cup tumbled in the air, with silver drops of sakè flying from it like the sparks from the pinwheels nailed to bridges during summer fireworks displays. 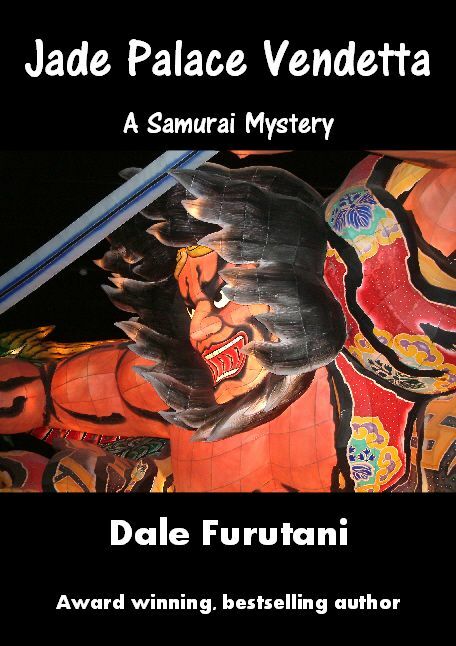 The standing samurai took a befuddled slice, and the wooden cup, untouched, tumbled to the worn tatami mats and bounced twice before coming to rest. The sitting samurai laughed uproariously. “Well, let’s see you try it,” the swaying samurai said indignantly. He took exaggerated pains to insert the tip of his katana in his scabbard, his drunken state making this simple task, one of the most basic moves taught to beginning students of the sword, a sudden challenge. He finally got his blade into the scabbard and plopped back onto the mats. His friend obligingly crawled over and picked up the cup. He stood as unsteadily on his feet as his companion had. Hefting the cup in one hand, he extracted his sword from its scabbard. “Watch,” he said, tossing the cup up into the air. pate. Instead, his hair was drawn back and tied in a topknot. He saw the cup flying toward him and, with nonchalant agility, he reached out with his free hand and grabbed the cup before it hit him. His other hand, holding the hot teacup to his lips, didn’t sway or spill a drop. “Hey, give me the cup back,” the drunk roared. “So you can play oibane with it again?” The ronin put his teacup down. Oibane was traditionally played by young girls on New Year’s Day, so the drunk viewed this as an insult. “What’s your name?” the standing drunk demanded. The ronin considered this question. The last time he had been formally asked this, he had been standing in the mountains. He had looked up and been struck by the beauty of the wind moving the pines on a mountainside. He had invented a name based on the beauty he had seen. He decided that the name he had given then was as good as any he could create today. “I’m Matsuyama Kaze,” he said. “Why not?” Kaze said. In one fluid motion he stood and tossed the cup in the air without a second’s hesitation; then he took his sword out of its scabbard and smoothly drew his sword through the center of the falling wooden cup. The speed of the blow and the sharpness of the sword allowed Kaze to cleave the wooden cup in two while it was still in the air. The two pieces of the severed sakè cup hit the tatami mat just as Kaze was returning his katana to its scabbard. “By the Lord Buddha, what luck!” the first samurai exclaimed. “Come on. Come on. Let’s see another demonstration,” the second drunk said. He reached over and grabbed another cup. “This silly game is not worth destroying the property of the innkeeper,” Kaze said. “Are you still saying it wasn’t luck?” the first drunk said argumentatively.
. I’m sorry,” Kaze apologized. “That’s because you can’t do it,” the second one said. “But I can,” Kaze said mildly. “And if I do it will you stop bothering me?” Kaze asked. “Of course, of course,” the drunken samurai said reasonably. The first one looked slyly at his companion, then pointed to a fly buzzing in the room. “Let’s see you cut that,” he said with a guffaw. “Yes, cut the fly. Cut the fly,” the second one laughed. Kaze said nothing but stared at the two samurai for a few seconds. Then he walked away. Behind him he could hear the raucous laughter of the two drunks. Kaze stepped out of the teahouse and looked up at the sky. It looked like a piece of rough, gray mulberry paper that had been streaked with an ink wash. The puffy dark slashes delineated clouds heavy with rain, much as a brush heavy with black ink would be used to paint such clouds. Kaze could smell the thick scent of rain and feel the oppressive pressure of a gathering storm. He thought about returning to the tea-house to seek shelter. He knew he could will himself to ignore the two drunks; he would simply draw the internal curtain that allowed a Japanese to not see what he was seeing and not hear what he was hearing. Sometimes pretending not to see or hear was what allowed Japanese society to function. Kaze could ill afford to draw attention to himself by engaging in foolishness with a couple of drunken buffoons. There were fifty thousand ronin wandering Japan, most of them displaced by a great civil war when they ended up on the losing side. Some had turned to banditry, others had already given up the warrior’s life for farming or trading, and many were still seeking employment with one of the victorious lords who had supported the winning Tokugawa clan. A few were still sought by the Tokugawas as enemies. Kaze was one of these few. of the Tokaido Road was Kyoto, the ancient capital for almost eight hundred years and the home of the Emperor. 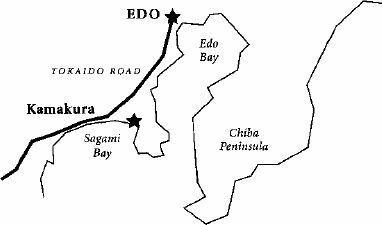 At the other end of the Tokaido Road was Edo, the new capital and the stronghold of the Tokugawas, the new rulers of Japan. Kaze stood physically and metaphorically between the old and the new, longing for a happier past but unafraid of a harsh future. Before the civil war, the Tokaido Road had been thick with traffic, with travelers sometimes walking shoulder to shoulder at congested spots. During the civil war traffic had dropped precipitously. Since the Tokugawa victory almost three years before and the subsequent uneasy peace, traffic was beginning to increase, although the danger from bandits made a journey still precarious. Often only a few brave merchants, ronin, ne’er-do-wells and bandits were found along the road. Sometimes it was difficult to tell one from the other. , or family crest, of three plum blossoms. This cloth was given to him by an unlikely group, a trio led by a grandmother who was on an officially sanctioned vendetta. With a serious grievance, it was possible to get the government to sanction private revenge. , the grandmother, was accompanied on her mission of vengeance by her fifteen-year-old grandson and an old servant who looked like a bag of bones. The grandmother said she was looking for a merchant who traveled the Tokaido Road, so Kaze had also come to the great road, seeking the trio in an effort to learn more about where they had found the cloth with his Lord’s family crest. Now that he was at the Tokaido, he had no idea which direction to go; toward Kyoto or toward his enemy’s stronghold of Edo? He had asked about the trio at the teahouse but had received no information from the proprietor. The teahouse owner had assured Kaze he would remember the group described, but it was only a matter of chance that any group traveling the Tokaido would stop at a particular roadside teahouse. knife that he kept in a groove in his scabbard and quickly cut a point on one end of the stick. Returning the ko-gatana, he threw the stick in the air, watching it tumble end over end before it hit the dirt road. The point was aimed toward Edo. Squaring his shoulders, Kaze took his katana out of his sash and rested it on one shoulder, as one might carry a musket. He turned toward Edo and started walking down the Tokaido with the long gait of a man used to covering great distances on foot. Once out of the village, the Tokaido Road turned into a wandering path that cut through forest, mountains, and fields. It usually took two weeks for a man to make the journey from Kyoto to Edo, although a fast dispatch could make the journey in three to four days, exchanging horses and sometimes riders at one of the fifty-three stations along the road. Kaze had come out of the mountains near Edo. He had been in the mountains for months, methodically checking villages, looking for the girl. The tedious searching had not discouraged him. Now that he had finally come across the scrap of cloth that might be a connection to the girl, it was as if it was only the first day of his search, not almost the third year. branches, and spots of gold sunlight dotted the road, mirroring the bits of sky. Today, with the threatening skies, the leafy tunnels were dark holes filled with unpleasant possibilities. Even in the open sections, the dark day made the road uninviting and gloomy. Kaze saw no others as he walked. He surmised that other travelers must be discouraged by the bad weather and holed up like badgers. Kaze looked up at the roiling clouds and saw that the streaks of black were sweeping toward the earth. It was already raining behind him, and soon it would be raining on him. He decided that it would take a man driven by some great need, just as he was, to be traveling the Tokaido in this weather.